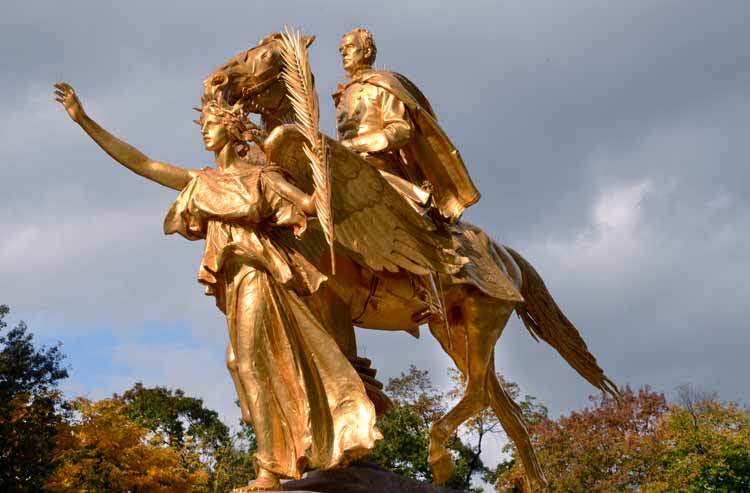 The sculpture of General William Tecumseh Sherman is one of the finest sculptures by the talented American sculptor and New York City resident Augustus St.Gaudens. In 1892 St. Gaudens modeled a bust of the general who lived in New York after the Civil War. He then created the equestrian sculpture in Paris, France, completing it in 1903. After much discussion, the sculpture was placed at the main entrance to the Park, befitting such an important historical figure and monumental work of art. When the Pulitzer Fountain was designed in 1913 for the southern half of Grand Army Plaza, the Sherman Monument and surrounding landscape were moved so that the two halves of the plaza could be symmetrical. In September 2015 Central Park Conservancy completed a major restoration of the northern half of Grand Army Plaza. The project involved cleaning the bronze and applying new gold leaf to the surface of the statue. A protective coating of wax — tinted to emphasize the sculptural detail of the monument — was layered on top. In addition, the Conservancy repaved the plaza according to its historic design, regraded it to be wheelchair accessible, and overhauled drainage and irrigation infrastructure. Existing lamps and deteriorated benches were replaced with new ones based on the design of the original features which were installed in 1916. Finally, the Conservancy replaced the trees around the perimeter lost in a snowstorm in October 2011. The plaza now features a new double row of London plane trees, consistent with the original design. Grand Army Plaza; Fifth Avenue between 59th and 60th Streets.